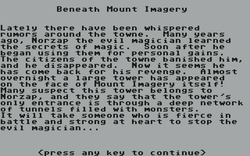 Beneath Mount Imagery is an Imagery! adventure written by Roy Riggs of Dr. Evil Laboratories. This page was last edited on 27 March 2019, at 06:12.